Experience the culture, history and beautiful scenery of Kyparissian Gulf, from the saddle of a bike . A bicycle tour allows you to find things that might have been missing, if you were in a car. Enjoy a chance encounter with a local, a stunning landscape, the sights and sounds of nature up close, ancient ruins or a secluded cove. Follow one of the many bike paths or even make one of your own. Choose what suits you more, cycling for training or just riding for fun. Fill your lungs with fresh air, with that, you contribute your bit to fight for the protection of nature and the greenhouse effect. You are, in paradise cyclists, with guaranteed sunshine. Because of the exceptional weather conditions, in the area, everyone can be satisfied by cycling, all year round. Here, it is very rare to meet strong winds. Within 10 km you can go through rocky terrain in soil and very steep, level allowing you to experience all in a very short time. We can organize your trip through different landscapes combining mountain biking, the lacy beaches, tranquil vineyards and plantations of olive trees with fascinating ancient ruins of history like: Vounaki, Peristeria, Castle of Kyparissia, Malthi, Lepreon, Prasidaki, Olympia, Pylos, etc. 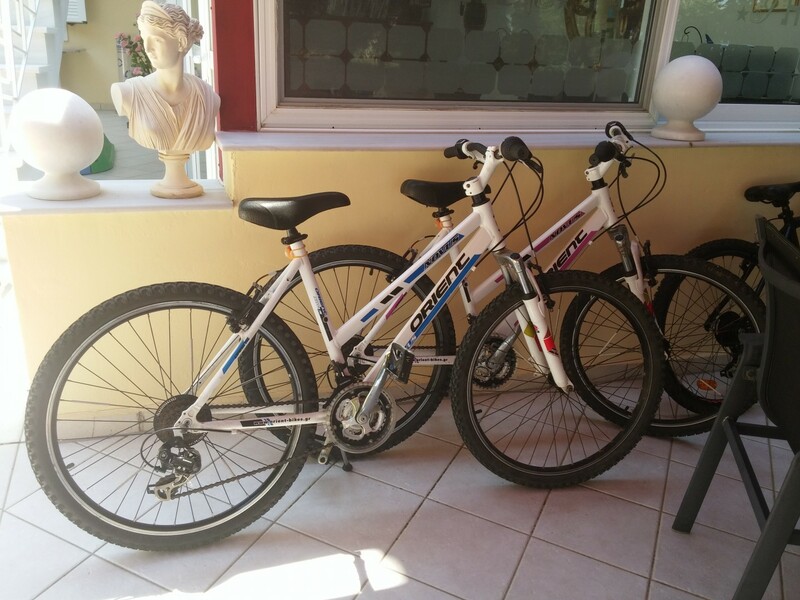 Now as a certified ‘Bike Friendly Hotel’, an accreditation awarded by the nonprofit making organization NATTOUR in cooperation with the Hellenic Society for the Protection of Nature (EEPF). The Irida Resort Suites, belongs to an exclusive list of destinations in Greece that have earned the ‘bike-friendly’ label. We love cycling, we welcome cyclists and support cycling activities in the area of Mesinnia. Tired cyclists can relax by taking advantage of our massage services and bring the day to a truly satisfying end, after a spin through the vibrant landscape of Messinia. Electric bicycle battery charging point.